A girl for all seasons: Pure Madness! Yesterday was the BIG day. The nominations for the A.I.M.S awards were being announced. For those of you not-in-the-know, these are the accolades which are bestowed on all the amateur musicals which are performed all around the country. The week after working backstage on "Tom and Viv" with Bradán Players, I was off to Leixlip Musical and Variety Group to work backstage on "Our House". This is the musical based on the songs of the 80's group Madness. I knew one or two of their songs, but only realised how many hits they actually had when I started working on the musical. Sets were awesome, and so backstage was hectic. Anne and I were assigned to our truck on stage left...and the madness began in earnest. List of instructions was handed on to us from Mary, our revered stage manager. Move it from "Casey Street/ black and white to "Casey Street/normal". Then there was "Casey Street/ Back to Normal/ Back"....and it went on and on. Even on the last night, when we should have been able to do it with our eyes closed we were still checking instructions just before each scene change....to be sure, to be sure. Throw in half a car, a coffin and a few school desks on wheels, and there wasn't room backstage to change your mind! In face there was just about room for Mary's box of condoms! Now she claims that they were merely props, but I have my doubts! But it was a FANTASTIC show! 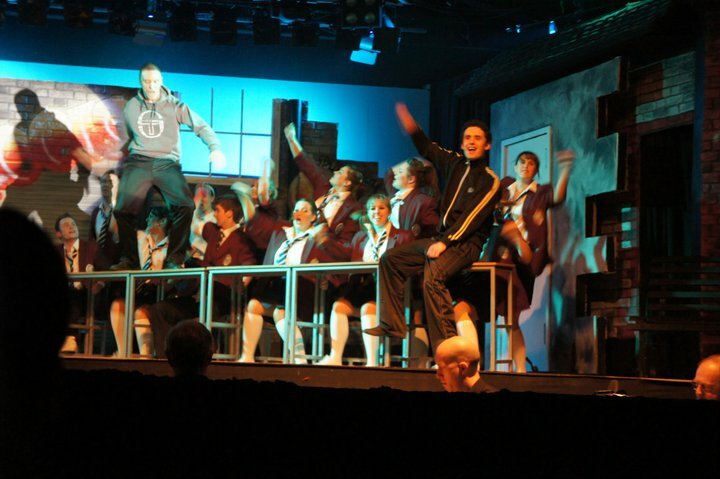 The energy from the cast was leapin' off the stage. Here is a clip from the show. If you look very, very, very closely you can just about see the scene change from "Casey Street/Normal to Casey Street Front". That's how good us Backstage crew were!! So, "Tom and Viv" was nominated for Best Stage Management in the All-Ireland Drama festival. "Our House" was also nominated for Best Stage Management for AIMS. I was part of both crews. Ahem. Just saying! Bring on the Awards weekend in Killarney in June!